Not to be confused with Volcano, California. Volcanoes come in all sorts of shapes and sizes. Although the name evokes images of the conical mountain spewing ash and lava, such events are rare though often newsworthy, and are probably best seen on the TV news rather than witnessed up close and in person. However, many volcanoes around the world are tourist attractions in their own right and are worth a visit, so one can appreciate the awesome power of nature in person. Some of the largest volcanoes on earth are not recognisable as such. For example, Yellowstone in the United States, Toba in Indonesia, and Taupo in New Zealand are known as super-volcanoes. They are generally in the form of large calderas, which are giant volcanic depressions formed either by large explosive eruptions or quiet long-term drainage of magma, and they often have associated lava flows or domes. Most supervolcanoes are explosive in origin and have undergone unimaginably huge eruptions in the geologic past. However, it is important to note that such volcanoes have erupted violently very infrequently, usually only once every 100,000-800,000 years. Hence, there is no reason to worry that Yellowstone, for example, will explode within your lifetime! Many are so big that, for many years, geologists did not appreciate that these features were volcanoes in their own rights. Compared to these, the currently active volcanoes on earth are relatively quite small! Although there are literally hundreds of active volcanoes around the world, there are many more that are extinct. One can still appreciate the awesome power of nature from such places without the hazards that go with active volcanoes. A volcano is defined as active if it has erupted within the last 10,000 years (less than a second in geological time! ), according to the Smithsonian Global Volcanism Program, the major volcano monitoring organization based in Washington, DC. One that is active but not currently erupting is considered dormant. Any volcano that has not erupted for more than 10,000 years and often, but not always, lacking geothermal heat and activity, may be considered extinct. (But this is problematic when dealing with supervolcanoes because of their long and slow cycles of activity, and not to mention that some supposedly extinct volcanoes can come back to life). Throughout volcanic areas of the world, one may also encounter geothermal areas. These places are often, but not always, associated with volcanic activity. Hot springs, geysers, mud pools and fumaroles (steam/gas vents) are common features in geothermal areas, and can be scenic and hot springs can be great places to take a dip in. Countries such as Japan and Iceland are especially famous for hot spring baths. Geothermal areas are also an environmentally friendly source of energy, and Iceland takes advantage of this very well. Yellowstone National Park is probably the best known example of a geothermal area, as molten magma lies not far beneath its 640,000 year-old caldera. New Zealand, with its volcanoes in the North Island, is also known for extensive geothermal areas. If you are intending to venture into an area containing a highly active volcano, be aware that you are entering a potential hazard zone. Depending on the level of activity, the hazard zone may extend for several dozen kilometres, and there is the serious potential for pyroclastic flows and flying volcanic bombs, which are larger pieces of rocks thrown up by eruptions. Other associated hazards like volcanic ashfall and lahars (volcanic mudflows) can extend for hundreds of kilometres more. Volcanic bombs can be up to the size of a soccer ball or even larger - enough to kill an unprotected person. Pyroclastic flows are clouds of red-hot ash and other volcanic debris that rush downslope from their source vents. They are some of the most dangerous parts of volcanic eruptions, as the temperature inside a pyroclastic flow can reach 400-700°C (~750-1300°F) and can reach speeds of up to 150 km/h (93 mph). Obviously, this means they can literally incinerate everything flammable in their path and then bury the area in hot ash. Also, volcanic ash tends to stop aircraft and vehicle engines, so transportation in the area may be restricted or disrupted. Public safety authorities may order hazard areas evacuated and would normally prefer that the casual tourist stay well away, but authorities are slow to act in much of the world. This does not eliminate dangers. Unless you have some very genuine reasons for going to these places, the best advice is to stay away and watch it from the safety of your home on the TV news. When active volcanoes are not erupting (in other words, simply dormant), many of them can be approached reasonably closely in safety. However, when visiting active volcanic areas, there are still plenty of hazards even in dormant volcanic areas. New lava flows may still be very hot for months or even years afterwards and may be only covered with a thin crust of solid rock. Old lava flows can be as sharp as broken glass, so wearing a good pair of shoes or hiking boots are a must. Gases may be seeping out of vents, poisonous enough to kill. Towns many kilometres away may be prone to a lahar, basically old ash leftover from an eruption that acts like an avalanche or raging flow (that debris and ash may be many years old as the event that generated it forgotten) that becomes mobile by rainfall or earthquake. Lahars depending on size and speed, can be as devastating as an eruption itself, bury victims alive, and can kill thousands of people and bury and bulldoze homes, but unlike eruptions which give more obvious warning signs, lahars happen with zero warning and with often zero notice from authorities. Keep in mind lahars hazards during periods of heavy rainfall. Even geothermal areas can be hazardous. Many of the hazards encountered in geothermal areas are similar to volcanic hazards, because both arise from similar geological mechanisms. Hot springs and mud pools can be boiling hot, acidic or downright poisonous, hence do not even try to take a dip or approach unless it is absolutely safe to do so. Geysers are a common feature of major geothermal areas, and can erupt hot water or mud unexpectedly. Landslides are also common, as even volcanic rock can become weakened over time with acidic fumes seeping out of fumaroles (steam/gas vents) or hot springs. Noxious gases may come out of vents or similar holes in the ground and may be concentrated in enclosed low-lying spaces such as caves, manholes, and pool enclosures. Carbon dioxide, a byproduct of volcanic activity, is notorious for this and can kill swiftly with little or no warning. A selection of some of the more active and/or better known volcanoes in the world today. Some of these can still be explored from up close. Kilimanjaro in Tanzania is Africa's tallest peak at 5895m (19,340 ft). It has a series of concentric summit craters apparently less than 10,000 years old and may have last erupted less than 2000 years ago. The name Kilimanjaro means "shining mountain" in Swahili, no doubt due to the once-extensive glaciers which are unfortunately disappearing rapidly each year. Ol Doinyo Lengai ("Mountain of God" in the Masai tongue), in Tanzania, is the only volcano on Earth that erupts natrocarbonatite lava. This type of lava emerges black, cools to grey, and oxidises to white. Mount Cameroon The only volcano outside of Europe to have records of an eruption before the Common Era in 5 BC. It remains active today, with its most recent eruption in 2000. With 167 known active volcanoes, Indonesia is the world's most volcanic country by far. Volcano Adventure Indonesia, Sukapura, ☎ +62 335 581439, +62 813 1909 0225, runs specialist volcano tours all around the country. Mount Bromo in East Java is known for its unreal scenery, especially with Mount Semeru, Indonesia's third highest active volcano nearby. 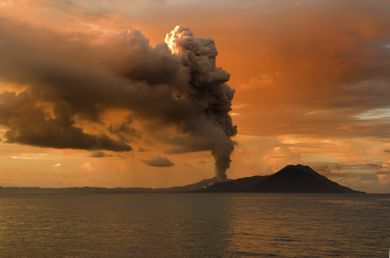 Krakatoa in West Java famously exploded so violently in 1883 that the sound was heard 5,000km away and global temperatures dipped by over a degree. Mount Batur in Bali is a very accessible active volcano which takes just 2 hours to climb. Mount Merapi is perhaps Indonesia's single most active volcano (no mean feat). It looms large over the major cities of Yogyakarta and Solo, and the very popular temples of Borobudur and Prambanan. 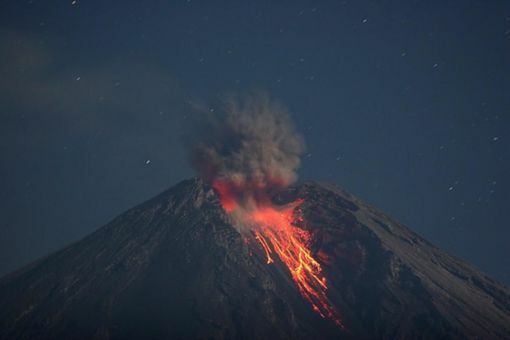 Merapi has erupted 68 times since formal record keeping began in the 16th century. Mount Rinjani in Lombok is Indonesia's second highest volcano with a stunning crater lake. For much of 2009 the summit of the mountain was closed to the public due to eruptive activity. Mount Tambora in Sumbawa is one for the truly adventurous. Only about 50 visitors a year make it to this very remote volcano. In 1814 Tambora was 4,200 metres high. It erupted with such force the following year that 1,400 metres was lost from its top. Mount Aso on the island of Kyushu in Japan, is one of the largest active volcanoes in the world with the largest caldera. Mount Fuji in central Japan near Tokyo, is Japan's highest and most beautiful volcano. It is also the most climbed mountain in the world because so many people climb it to view the sunrise from its summit crater. Mayon Volcano, near Legazpi City in the Philippines, described as the world's most perfect volcano cone. Mayon’s last fatal eruption was in 1993. El Teide in Tenerife, is the highest active volcano in the Canary Islands at 3715 m (12,188 ft). A flank vent at El Teide was observed erupting by Christopher Columbus and his crew in 1492. Vesuvius near Naples in Italy is an active (but presently "dormant") volcano. It has not been smoking since it last erupted in 1944, but it is still very closely monitored because of its seriously hazardous proximity to Naples, which is southern Italy's largest city. Stromboli in the Aeolian Islands of Italy and Mount Etna in Sicily, Italy are two of Italy's most active volcanoes. At 3350 m (10,991 ft), Etna is Europe's highest volcano. Stromboli has been in near continuous activity since at least the time of the Ancient Greeks and has been billed as the "Lighthouse of the Mediterranean". Nisyros in the Greek Dodecanese islands is mildly active with smoking fumaroles. It is possible to walk into the crater floor for a closer look. Santorini in the Aegean Sea, is probably Greece's most famous volcano because of its eruption that destroyed the Minoan civilization over 3,600 years ago. It is still active, for it last erupted in 1950 out of Nea Kameni ("New Burnt" in Greek), an island made up of lava flows in the middle of the caldera bay. Lassen Peak, in Shasta County, California, USA. It is known for its 22 May 1915 eruption that was the last volcano to erupt in the US until Mt. St. Helens in 1980. Several volcanic features are located along with the mountain at Lassen Volcanic National Park, and is not far from California's tallest active volcano, Mt. Shasta. Mount St. Helens, in Washington State, USA, is famous for its 18 May 1980 eruption. Since late 2004, it has been erupting once again, but not nearly as violently - this time, a new lava dome is slowly being extruded in its crater. Mount Rainier, also in Washington State. Last erupted in the 1800's and has frequently buried much of the Seattle-Tacoma metropolitan area, especially the Carbon and Puyallup river valleys, in several meters of volcanic mudflows (lahars) over the last 10,000 years. Earthquake activity and thermal features indicate Rainier is still active, and is on the Decade Volcanoes list as one of the most dangerous in the world. Popocatepetl, near Mexico City, often has a volcanic plume above its crater which is 5,450m high. The name means "smoking mountain" in the native Nahuatl language. Soufriere Hills volcano on Montserrat, previously considered dormant, began erupting again in 1995, forcing the closure of the southern half of the island (including its capital and airport in 1997). It is still active, though mostly a nuisance seeping lava and spewing ash into the air. Mirage Hotel and Casino, has a volcano that erupts up to five times nightly. Cotopaxi in Ecuador, often misquoted as being the highest volcano in the world ( despite its elevation of 5911m (19,393 ft), it does not even make the top ten list of highest active volcanoes - see this list here), is still one of South America's most spectacular volcanoes. Arenal in Costa Rica can be viewed lighting up the night sky with its highly frequent eruptions. Volcan Masaya in Nicaragua, near Managua. Volcan Santa Maria and Volcan Santiaguito in Guatemala, near Quetzaltenango. Volcan de Fuego and Volcan Pacaya in Guatemala, near Antigua Guatemala. Volcan Atitlan, Volcan San Pedro and Volcan Toliman in Guatemala, on the southern shores of Lake Atitlán. Volcan Láscar in the Atacama Region of northern Chile. Kilauea in the Big Island of Hawaii, has been erupting continuously out of its flank vent, known as Pu'u O'o ("Hill of the O'o bird" in the native Hawai'ian language) since 1983. Mauna Loa, also in Hawaii, is the state's highest historically active volcano and is topped by the Moku'aweoeo Caldera. It is also the largest volcano by volume in the world. Don't be fooled by its gentle slopes - with its highest point at 4170m (13,683 ft), the altitude can be hard on inexperienced hikers and its summit is often covered in snow during the winter. Mauna Kea is the highest volcano in Hawaii at 4205m (13,796 ft), and is pockmarked with cinder cones. Its high elevation is also a magnet for astronomers with their giant telescope facilities - and even skiers. Haleakalā ("House of the sun" in Hawaiian), is the tallest volcano on the island of Maui, and is renowned for its erosional crater and the cinder cones nestled inside. Mount Ruapehu, Mount Ngauruhoe and Mount Tongariro in New Zealand's Tongariro National Park. Ruapehu, New Zealand's highest volcano, has a crater lake that forms and fills when the volcano is not erupting. White Island, also in New Zealand, is the most active volcano in that country and is a volcanic island in the Bay of Plenty southeast of Auckland. Organized tours are operated out to this volcano. Mount Tavurvur is a very active volcano right next to the city of Rabaul on the island of New Britain. It last erupted on 7 October 2006, shattering windows up to 12 kilometres away and sending an ash plume 18km into the stratosphere. The following travel agencies specialize in volcano tourism. Volcano Adventure Indonesia, Sukapura, Indonesia, tel. +62-335-581439 , +62-81319090225, . Tours to Mount Bromo and elsewhere in Indonesia. VolcanoDiscovery, Germany, tel. +49-2241-2080175, +30-2107522310, . This tour operator is specialized on international volcanoes and one of its most important programs are provided for Indonesian volcanoes. The tours are trekking & photography tours with small groups and an intensive personal service. The tours are usually about 7-14 days. This page was last edited on 31 May 2016, at 20:18.